PRAISE GOD!! Winter has arrived…..AGAIN! So much for the Groundhog! As I work here on my computer I am having visions of deep snow in the driveway that will take up hours of my time. Oh well, March has come in like a lion and hopefully this means it will go out like a lamb…and how appropriate with Easter on the last weekend of March. The good news is that the storm is in the middle of the week and we LEAVE for Guatemala very early on Saturday morning. Our Guatemala mission begins in the middle of the night on Friday evening when we will journey to Battle Creek with our team members and lots of luggage bearing gifts and materials. We’ll park our cars at the North Avenue Church of God, which has very graciously agreed to drop us off in Chicago’s O’Hare airport with their 25 passenger bus and pick us back up on the following Sunday morning. David Beam, our missionary, is anticipating our arrival late Saturday night into Guatemala City. Then we’re off in a whirlwind as we worship with the church of the TRACKS Sunday morning and then begin our week of construction and interacting with the people of the Tracks. Everyone is going to be BLESSED! God has answered MANY prayers; we have paid all of our expenses so far, and have only luggage costs and transportation yet to deal with. However, we have money in the bank. Praise God for blessing us!! PLEASE keep us in your prayers this week, March 5 through 13, and we will see you in church the following Sunday. State Youth Convention season is here again. 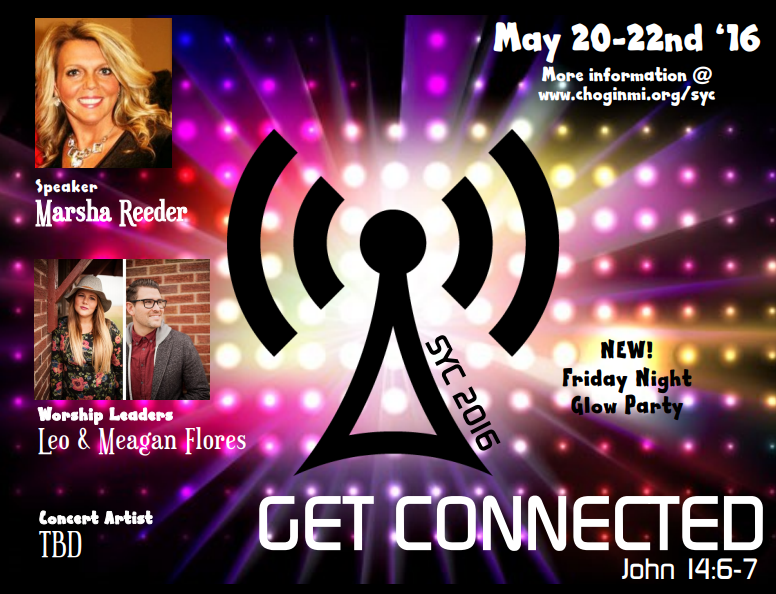 The convention is the weekend of May 20-22 in Kalamazoo at Western Michigan University. This is Michigan’s largest youth event of the year and features top quality programming for CHOG students throughout Michigan. Over 800 students are expected to be in attendance. IMPACT KALAMAZOO 2016 will be our mission moment at this year’s convention. On Saturday, from 12:30–3:00 p.m., the entire convention will once again have the opportunity to minister to Kalamazoo through an organization called “Jesus Loves Kalamazoo.” Groups will be given a designated area to hand out water and pray for people. The cost of the convention is $120 with early registration. Registration for the convention is a non-refundable $40 due by Sunday, March 27, 2016 to our Mt. Haley Youth Ministry with the $80 balance due by Tuesday, May 15. If you register after March 27, it will be $50 registration deposit in April and $75 registration deposit in May. It pays to register early. We have a special deal for Mt. Haley youth (6th grade – 1 year out of High School). If you pay cash, check or by youth account by March 27, the Mt. Haley Youth Ministry will match the $40 registration and only leave you with a $40 balance due in May. During April and May there will be several fundraising opportunities to earn the remaining balance. Also, if you register by March 27, we will include a special Youth Convention T-Shirt paid for by the Mt. Haley Youth Ministry. Opportunities for fundraising in April & May include: the raking and clean-up of Olive’s yard (which we need to work together to do after the snow melts); gift card sales which can be individual or group in late March, early April; Youth Garage Sale on Friday & Saturday, April 29 &30 (help work & organize); and the Hanging Basket Sale plus pop can collections. Otherwise, you need to have your SYC balance paid by May 15. We are still studying the “Commandments of Jesus” in our weekly gatherings of both youth & GRADS. We are down to our last 2 or 3 commandments, and then we’ll move on to another topic. We are doing a Nooma Video Series in our Bible Study on Sunday mornings highlighting various aspects of living as a disciple of Christ. The GRADS @ Grahams are doing the same subject and we will be moving on to another topic after we return from Guatemala. Our Super Bowling party had a good turnout with a dozen of us enjoying an afternoon at Valley Lanes on the day of the Broncos’ victory. We have not, at this time, planned a Lock-In because our Sunday night attendance has been so low. For several months, we have only had the highest of six students (3 from one family) with many Sundays less than that. It is very difficult to plan a large activity without people in attendance and we feel our lessons on the Word of God take priority as the most important event in the Youth Ministry. We have 17 students from 12 families who say they are part of the Mt. Haley Church of God; however, the students and their families have not been attending church on a regular basis. We have prayed about this issue for many months so we will leave it in God’s hands. We know we are competing with homework, jobs, other activities, time and distance, but God’s Word continues weekly and daily and you are MISSED. God’s Ministry continues on! !